Had my first attempt at taking starscapes tonight, I've got a long way to go but here's my first try. Not too shabby at all Cain. You must be happy with. I presume you used your 7D but what lens and what settings ? There's a lot of room to improve, yer with the 7D and the kit 18-135mm lens at f.4.0 , 30 second exposure and 1600 iso. I've got a lot to learn. Pleiades over at the far left edge. 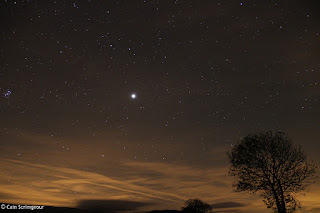 Anonymous, I'm not greatly clued up so unsure if thats Jupiter. Pleiades showed up well although I wish they were more in the frame.